Looking for business? you want to start business with minimal capital? I have here and I want to share it with you. This is not unique business but this is first from SUN Cellular promotion. They called it Sun XpressLoad Pro Onlinegosyo. The Sun XpressLoad Pro Onlinegosyo is an online business where you can sell SUN load without using your phone and retail sim. Just access your account online and sell it automatically. Of course you will think that you need PC and internet, Yes indeed! Because from the word itself "Sun XpressLoad Pro Onlinegosyo." 2. Bring your requirements such as: 1 Valid ID and P2,700 for your initial 3,000 Sun Retailer Load. This online business is very fit to those who have Internet Shop and of course this is available for all. For more details, you can contact SUN Cellular at 395-8776. Take note! this is not a paid post from SUN Cellular, we only want to give you an idea about this promo. For the meantime, If you like this information, please bookmark it now or visit this site more often for you to be updated. 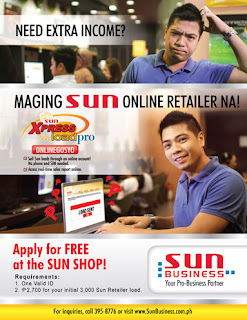 You may also share this post to your friends so they may know about Sun XpressLoad Pro Onlinegosyo . Comments or suggestions about "Sun XpressLoad Pro Onlinegosyo by SUN Cellular" is important to us, you may share it by using the comment box below.